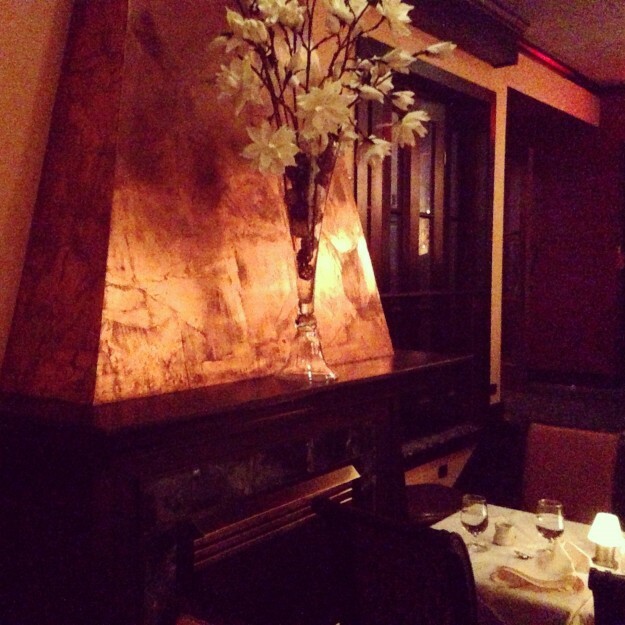 Siena Restaurant: Located on a cute street in Providence’s Federal Hill neighborhood. I don’t usually talk to my seatmates on airplanes. When I’m flying, it’s Gina time. I catch up on reading, magazines, or writing – or more often than not, sleep – and I do my best to avoid getting stuck in the clenches of a chatty person sitting next to me. This means I pretty much never start up a conversation with them. I changed that tune on my recent flight to Providence, Rhode Island. The lady sitting next to me and her husband beside her slept most of the way (my type of flyer), but we’d exchanged a few remarks and giggles the few times she woke up because the people in the rows around us could not sit still. Someone was getting up every two minutes to get something out of an overhead bin or go to the bathroom or to do seemingly nothing except make the people around them move. “I have never been on a flight where people get up so much!” she explained in half annoyance, half awe. She went back to sleep and I went back to working. Later, she woke up again and we bonded over having the same cuddly scarf from The Gap and how perfect it was for traveling. By the time the announcement came over the intercom that electronics needed to be put away I found myself wanting to talk to this nice lady who let me work peacefully for most of the flight. “Are you guys from Providence?” I asked. They were, and striking up a conversation with her was one of the smartest travel decisions I’ve made in awhile. Not only was she totally sweet, she gave me a restaurant recommendation leading me to the best Italian meal I’ve had in a long time. The meal was at Siena Restaurant. I was meeting my mom in Providence and told her how this lady had raved about Siena Restaurant. A quick Yelp search proved she was not alone in her fondness for the restaurant. Mom and I arrived at the hotel at 5:45pm. I called Siena at 6pm. It was a Wednesday so I figured we’d still be able to get in. “I can fit you in at 6:30,” the hostess responded to my request to make a reservation around 7:30 or 8. Packed on a Wednesday night? Already a good sign. I agreed to 6:30 and told my mom we had to get ready fast. Siena Restaurant is located in the Little Italy part of Providence known as Federal Hill along a stretch of street with colorful buildings and old world charm. Siena Restaurant is housed in a small building and manages to punch in a lively bar area with a relaxing Tuscan-inspired back room all in one small space. We were in the front of the restaurant meaning we got to sit by the lively bar as opposed to the peaceful Italian oasis in the back, but being Italian, my mom and I didn’t mind the loud talking and shouting. The Tuscan chateau ambiance of Siena’s back room. “Isn’t this fun?” Mom asked as we sat down. “Everyone sounds so loud and Italian.” They sounded slightly Jersey to me, but this is why I love traveling with my mom. She gets excited over everything. It’s a good travel mentality to have. And she can find the Italian in everything. Not that that was hard to do in Siena Restaurant. Siena is owned by two Italian brothers, Anthony and Chris. Anthony’s the chef and Chris runs the front of the house. 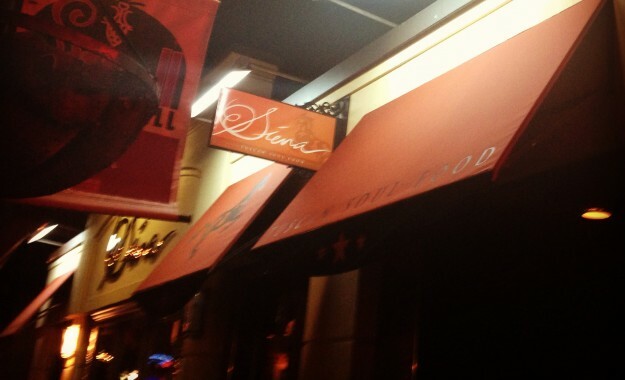 Their family is from Siena and Siena is also the middle name of one their daughters, hence the restaurant’s moniker. 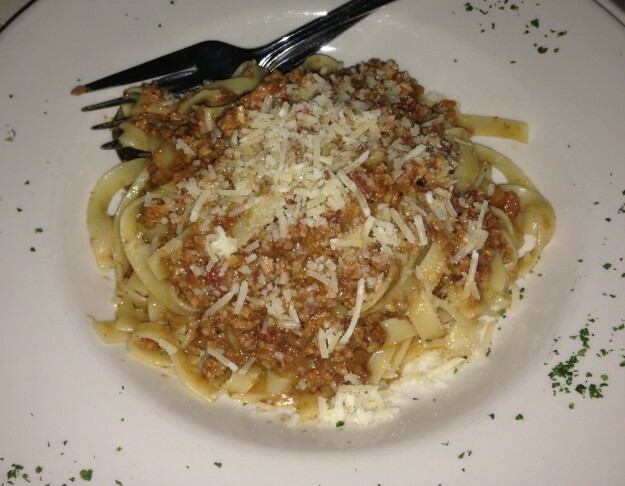 Anthony trained to become a chef in Bologna, Italy, which made it easy for Mom and me to choose the first entrée we’d split – the Tagliatelle alla Bolognese. We just had to decide on the other one, and an appetizer. Our server, Erin, was friendly and upbeat and surprisingly not hoarse (at least not yet) from having to talk loudly over all the east coast accents going on over at the bar. She was an expert on the menu. “Is the gnocchi homemade?” I asked. I wasn’t really planning on getting the gnocchi, but I’ve discovered if an Italian restaurant doesn’t make its gnocchi from scratch, it’s probably not going to be very good. She said it was, as was the pasta from that day’s special. 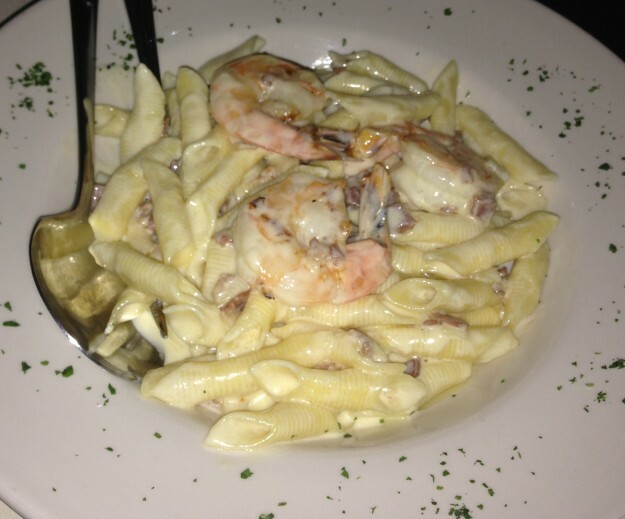 Mom liked the sound of the special, which was pasta mixed in truffle cream sauce with mushrooms, shrimp and prosciutto and the added bonus of two cheeses: mascarpone and parmesan. So we ordered that along with the Involtini di Melanzane as an appetizer. The appetizer arrived and not only was it a sight to behold, it was amazingly delicious. 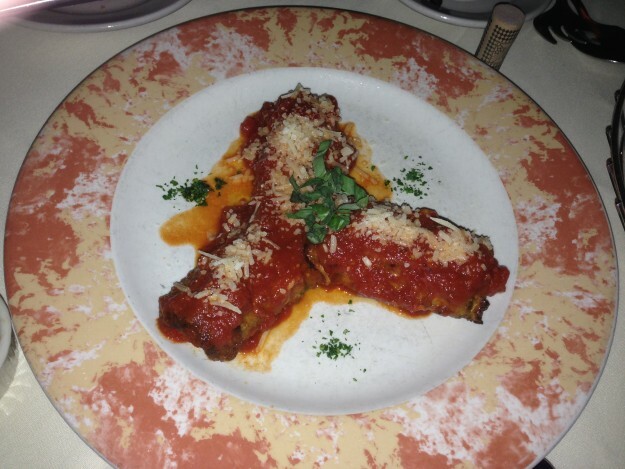 The Involtini de Melanzane is pan-fried eggplant rolled with prosciutto and ricotta cheese. It is then baked in the oven and covered in marinara sauce. It was pretty much awesome. I’m not even an eggplant fan, but I was drooling for more. The prosciutto gave the vegetable a salty kick and the marinara sauce was the perfect blend of olive oil and tomatoes. It was delicious. Despite being the signature dish of Siena Restaurant, the Tagliatelle alla Bolognese was one of the few dishes that did not come with homemade pasta due to how long it takes to make Tagliatelle from scratch, though the pasta that is used is imported from Italy. The authentic Bolognese sauce made up for it though. A hearty blend of spices mixed with pork, pancetta, sirloin and a touch of cream. The daily special was the highlight of the meal. The truffle sauce was divine, rich without being overpowering and perfectly matched the taste of the shrimp. Again, the prosciutto added a pleasing salty kick to the meal and the mascarpone and parmesan cheeses just made it all even better (as cheese is prone to do). The daily special – DELICIOUS! 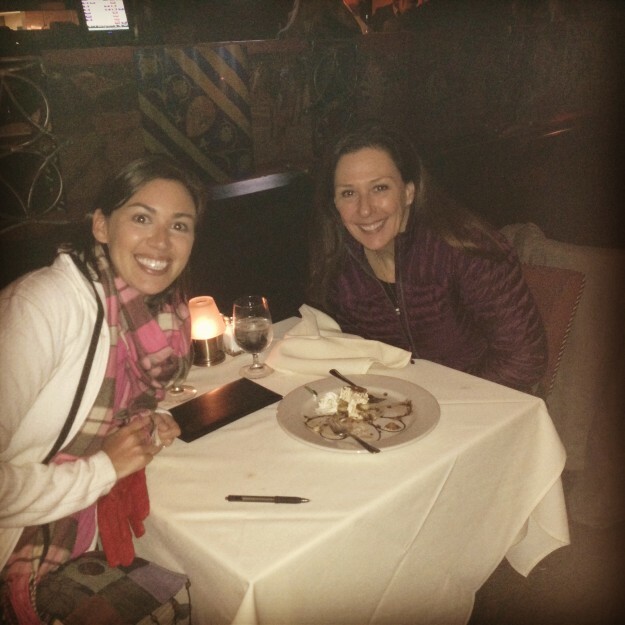 Siena also serves up Italian pizza and Italian desserts, including my favorite – Tiramisu. In addition to the location in Providence’s Federal Hill, Siena also has a location in East Greenwich, Rhode Island, called Siena Cucina · Enoteca. Mom and me after we devoured the Tiramisu. My mouth is watering! Great descriptions of the ingredients and prep.